Jimmerson wore a giant boxing glove on his left hand, as he was hoping the fight would not go to the ground. He landed zero punches before Gracie took him down and choked him out. 4. Ken Shamrock (shoot fighting) beat Pat Smith (tae kwon do) by submission. The Denver fans gave a hometown ovation to Smith. He was announced as having a record of 250-0 (whoa!). Both men employed the exact same offense: headbutts, then ankle locks. Shamrock’s ankle lock was better, and Smith tapped out. 5. In the first semifinal, Gerard Gordeau beat Kevin Rosier by TKO. Gordeau somehow broke his hand in the first fight, so it was taped up. Gordeau pounded Rosier against the fence and kept kicking and stomping him when he tried to get up. Realizing that this scenario would not change, Rosier’s cornerman threw in the towel. 6. In the second semifinal, Royce Gracie beat Ken Shamrock by submission. The announcers were drooling over the matchup and wishing it were the final bout. Shamrock sprawled nicely out of Gracie’s takedown attempt and tried to get a leglock. However, Gracie floated to the back and put Shamrock out with a rear naked choke. Before the main event, Rorion Gracie presented an award to his father, Helio Gracie, for paving the way for the UFC with his development of Brazilian jiu-jitsu. 7. 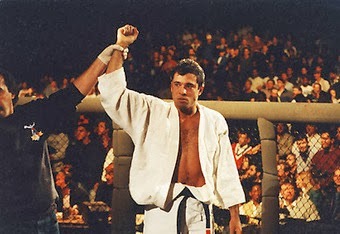 In the finals, Royce Gracie beat Gerard Gordeau by submission. Gracie tried to take the bigger man down, but Gordeau refused and hung onto the fence. Gracie finally got the takedown and floated to the back. The fans booed like crazy because they didn't understand what was going on. Gracie secured the rear naked choke for the tapout, the tournament win and the giant $50,000 check. After the fight, Gracie explained his fighting philosophy: "I don't want to give him a chance to hit me. I want to win without getting hit." @JeffDGorman is an MMA announcer. You can e-mail him at jeff@mmaspecialist.com and check out his work here.